Special Seeing-Eye Animal instead of a seeing-eye dog. Instead of a seeing-eye dog, Renata di Pietro of Cleveland, GA, relies on a different animal to guide her through life – her miniature horse, Angel. di Pietro has had guide dogs her whole life, but it got to a point where it was just too heartbreaking for her to handle since guide dogs only work or live for 6-10 years. “It’s very painful, because you love each one with all your heart,” says Renata. But then in 2007, on the hunt for another dog, Renata thought about a friend who had a mini horse as her guide. They’re rare: Experts estimate that there are just a dozen or so of them at work in the United States. 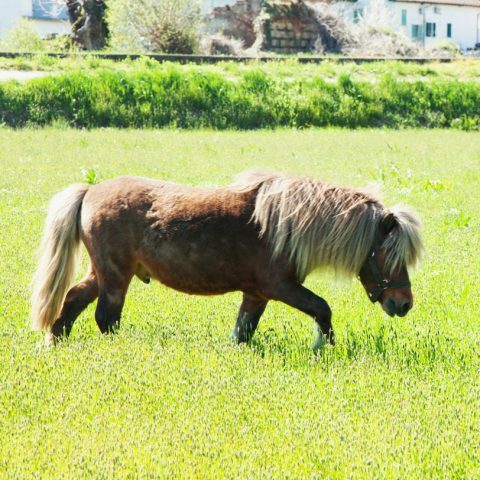 Renata knew from her friend that mini horses are calm, strong and typically live for 30 years or more. Renata paid a breeder $3,000 for Angel (many mini horses are available for $1,000 or less), and hired trainers she found through word of mouth to help ready the horse for service. She also paid $350 for a special harness, but the rest of Angel’s upkeep is pretty manageable: $20 a month for hay and feed, $20 every six to eight weeks for hoof trimming, and vet bills comparable to those for dogs. Now when Renata di Pietro walks into a store near her home in, jaws drop, cameras click and strangers want to talk. “It’s like the paparazzi are after me,” she says, laughing. The classically trained singer, who is legally blind, is used to an audience, but these days the main attraction is her loving miniature guide horse, Angel. Contact Dupont Real Estate when you are ready to buy or sell a home. We hope you enjoyed this article.